Every country exports and imports for its survival. As long as this equation of imports versus exports is balanced, it is good for the nation but when imports become more than exports, the value of the currency starts declining. It means that the country needs more from other countries while it has little to offer to them. Indian goods are bought with Indian rupees. Hence if the demand for Indian goods falls, consequently the demand for Indian rupee also falls. India has dual challenges. While the demand for Indian goods seems to be waning, due to export slippage, India continues to import crude (petrol/diesel) and other imports vital for the economy at high international commodity prices and an inelastic demand for gold and silver. Therefore the demand for the dollars continues to be high. This situation puts further pressure on the Indian rupee widening the current account deficit. 1) The price of petrol has gone up substantially. Also the price of diesel and LPG could spike. When the price of fuel goes up, the cost of transportation goes up and when the cost of transportation goes up, the cost of goods goes up and thus inflation goes up. As we have a current account deficit, rupee depreciation has an inflationary impact. 2) Companies which are dependent on raw material imports or have imported components could see profitability and market capitalization take a beating. This is because its profitability may get hit by higher input costs. 3) Foreign travel is set to get costlier. One would have to keep more rupees on hand to purchase dollars to fund foreign travel. 4) Studying in foreign universities may get costly. This is the same in the case of foreign travel; more rupees would be needed to fund foreign education. 5) Several electronic goods which depend on imports and royalty payouts may get more expensive. 6) NRIs and exporters would be happy and can be expected to remit more dollars as they would get a higher price. Companies like IT software, Pharma and BPO would gain from the dollars that they earn by providing goods and service abroad. 1.The Government can buy Indian Rupees from the foreign exchange market by selling its dollars. This would however reduce the foreign exchange reserves which are needed to fund our imports. Hence this is not a sustainable solution. 2.The Government can mandate banks to increase their Cash Reserve Ratio and Statutory Liquidity Ratio which means banks would have to deposit more rupees with the Reserve Bank. Alternately the central banks can issue bonds for the public. By these measures the central bank would reduce the liquidity in the system and try and make the rupee dearer. However, these measures have the effect of increasing interest rates which hurts profitability of companies and thus adversely affecting economic growth. When economic growth gets limited, the production of goods and services too gets unfavorably impacted giving rise to inflation. 3.The Government can ask companies who have dollar accounts to bring in the dollars back into the country and convert them into rupee accounts. This would increase demand for the rupee which in turn would stem the slide of the rupee. 4. The Government can make it easier for companies to borrow in dollars from abroad. Companies would get more rupees for every dollar borrowed. This would help them finance their working capital requirements. If the rupee regains its strength over a period of time, the borrower could have to return lesser rupees. However, if the rupee further slides then business would be at a disadvantage. Hence businesses would take this route based on their outlook of the rupee. 6.The Government can reschedule /delay in paying off its dollar debts with the hope that the rupee would regain strength subsequently. Thus at a later day lesser rupees would have to be coughed up to repay the debts. 7.The Government can increase the limit of FII investment in debt papers. This would certainly bring hot money seeking quick gains. Some flow of hot money would be useful. 8.The Government can liberalize foreign investments in insurance, aviation and retail, infrastructure sector, agro-based businesses as well as may reduce subsidy from various sectors. This would be one of the better moves as it would bring in serious long term money from abroad. 9.The Government could frame policies to restrict the import of gold by raising custom duty and thereby making investment in gold less attractive. 10.The Government could action some long standing economic reforms to induce both domestic and international investments. This would help in increasing production and productivity of the economy. Higher production along with productivity would help in increasing supply of goods and services and thereby reduce inflation. This would be a better and sustainable method for tackling both the rupee crisis as well as inflation. Economic reforms would bring in “Foreign Direct Investment”. Economic growth can improve investor confidence and this ultimately bringing back a higher trajectory of GDP growth. 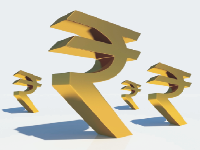 The depreciation of the rupee has an immediate impact on India in many ways, as discussed above. It is important to understand the macro-economic situation and the ways and means by which the Government can battle the challenges and try to steady the economy.